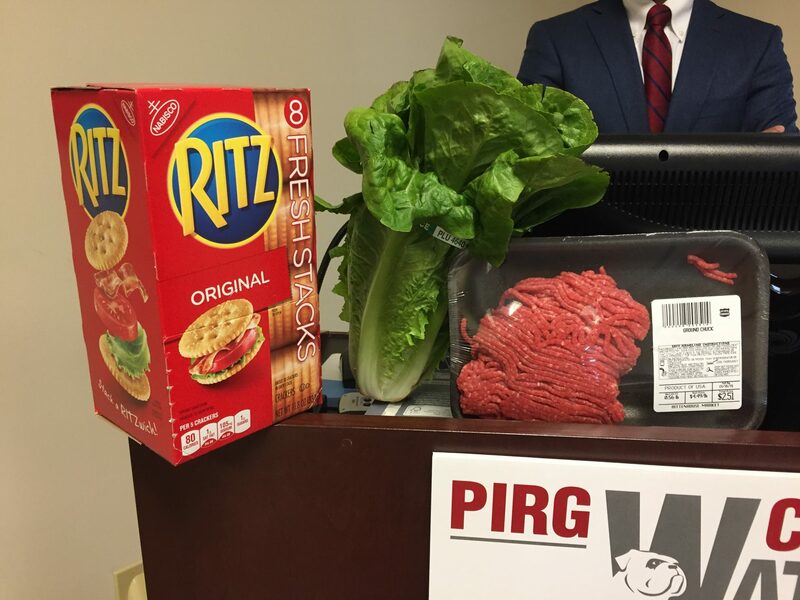 Ritz crackers, romaine lettuce, and beef were all recalled in 2018. “Consumers shouldn’t be rolling the dice when eating out or going to the grocery store." Romaine lettuce. Beef. Goldfish crackers. Honey Smacks. Last year was a bad one for food recalls, and, according to a new report, that’s part of a potentially worrying trend. A new report by U.S. PIRG, the consumer advocacy group, shows that food recalls have risen over the past five years, a jump the authors attribute to fundamental flaws in the country’s food safety system. “Consumers shouldn’t be rolling the dice when eating out or going to the grocery store,” said co-author Viveth Karthikeyan, consumer watchdog associate with U.S. PIRG. Karthikeyan and his co-author, Adam Garber, analyzed data from the Food and Drug Administration, which inspects items including processed foods, cheeses, and produce, and the USDA’s Food Safety and Inspection Service, which inspects meat and poultry. The authors found that between 2013 and 2018, the most hazardous meat and poultry recalls — for which the threat “involves a health hazard situation in which there is a reasonable probability that eating the food will cause health problems or death” — nearly doubled. Recalls across the board rose 10 percent over the same period. Karthikeyan said even though recalls dipped slightly between 2016 and 2018, that doesn’t necessarily mean the food supply was safer. “There are significant loopholes in our system that allows for lots of contamination,” Karthikeyan said, pointing to difficulties in tracing contamination back to its source and delays in the recall system that can result in contaminated products being sold even after a recall is announced. “So two hundred people getting sick from romaine lettuce is still something that would be a problem even if the number of recalls were going down,” he said. At the moment, some of those loopholes are compounded by the government shutdown. USDA meat and poultry inspections, recalls, and outbreak inspections have continued throughout the shutdown, though the workers have not been paid. And this week, the FDA — which oversees about 80 percent of the nation’s food supply — resumed inspections of high-risk foods like soft cheeses, baby food, seafood, some produce, and custard-filled bakery items. “Even during the lapse in funding, we’re continuing to support recalls as necessary to identify and respond to threats to the safety of human life, and activities for the surveillance and inspection of high-risk foods,” FDA Commissioner Scott Gottlieb said Thursday in a Twitter thread. But those “high-risk” foods only account for about a third of the FDA’s food inspections. Jaydee Hanson, a senior policy analyst at the Center for Food Safety, said the FDA should bring more workers back to secure the food system. Karthikeyan agreed that the government shutdown only increases the chances of lapses in an already dysfunctional system. To do that, Karthikeyan said, laws need to be updated to make it illegal to sell meat that has tested positive for salmonella. Salmonella is not classified as an “adulterant,” which is necessary to instigate a government recall, so companies only retrospectively recall contaminated meat after an outbreak is identified. Representatives from the USDA’s Food Safety and Inspection Service has said it needs more data linking resistant salmonella and illness to classify the pathogen as an adulterant. Karthikeyan also said irrigation water should be tested for dangerous levels of E. coli. Such water testing was part of the Food Safety Modernization Act, which was passed in 2011 and implemented in part in 2016, but the Trump administration has pushed back the implementation of water testing until 2022-2024. Karthikeyan said that’s too far into the future. “It’s something that we would encourage being implemented as soon as possible,” he said. FDA commissioner Gottlieb emphasized that the increase in recalls didn’t necessarily reflect a more dangerous food supply. Hanson, while pushing for more stringent water testing and additional inspections, also agreed that an increase in recalls over time isn’t necessarily bad news.